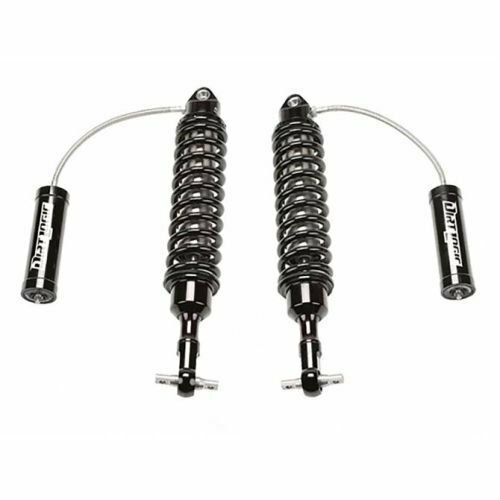 Best Shocks for Silverado 1500 4x4 Reviews in April 2019! Best Shocks for Silverado 1500 4×4: List of Top-Rated in 2019! Hi everyone, I’m Ken Coul and its time to discuss shock absorbers for your Chevy Silverado 1500 4WD vehicles. Before we dive into the list of the best 10 shock absorbers for this application, I just want to remind you of the shock absorber facts, and not fiction. Shock absorbers come in three types; they include the standard tube and piston model, the strut design and the hybrid piston and strut design. Each design is totally different in operation, and function. However, the bottom line is that they all perform the basic function of maintaining your tire’s tread on the surface of the road and this is to assure you control over your ride. I always state to my customers that shocks are not suspension systems, this is actually true for the first two categories, however, if you want to dish out a bit more cash, you can invest in a hybrid system which has both shock and suspension applications combined. OK, enough about this, I will conclude the review with a few words on the different types. Lets now look at the Best Shocks for Silverado 1500 and here are the ten leading models. 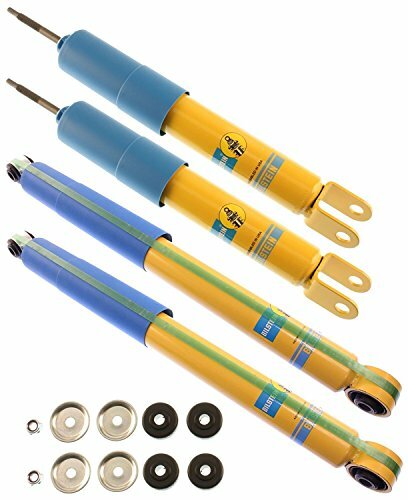 Bilstein is a fabricator of high-quality shock absorbers for just about every vehicle, and application there is. This kit includes their front #24-029056 and rear #24-065009 shocks that provide you with a perfect solution when integrated together in one active shock absorbing combination. This shock kit gives you amazing on and off-road control, with a smooth ride and a continuous excellent performance. The shocks are a mono-tube gas-filled design with a self-adjusting digressive piston for faster reaction times and heat dissipation. The front shock #24-065009 and rear shock #24-029056 are not extended for lifting; they are both a mono-high pressure nitrogen gas-filled tube design with a floating dividing and digressive piston that is a perfect solution for your heavy-duty towing and off-road driving needs. This valve comes with the classic Bilstein yellow and blue powder coated surface paint. This is yet another perfect example of high-quality engineering at work. 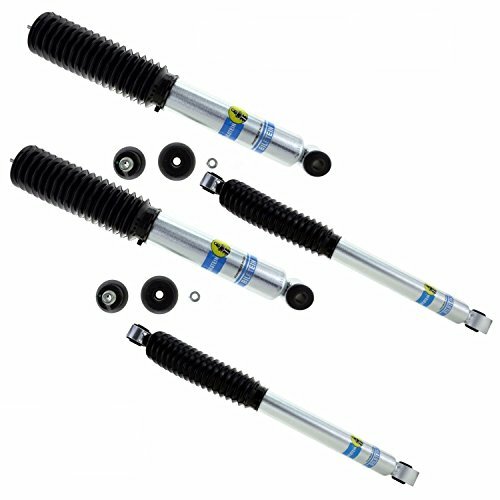 The Bilstein 5100 front and rear kit provide you with their front 0” to 2 ½” lift and a rear shock that gives you 1” lift. When combined they provide some leveling. The front shocks are 25.76” when fully extended and 11.3” when collapsed. The rear shocks are 26.15” when extended and 16.14” when collapsed. They both nitrogen gas filled monotube design, the rod diameter is 1.81,” and the mount style is an eyelet. They come with the standard Bilstein high-quality performance machining and include vulcanized neoprene rubber bushings with a floating self-adjusting digressive piston. Large, 2.75-in. (70mm) the tri-tube body which increases fluid capacity leading to a cooler operation. Large, heavy-duty 18mm Nitro-Carb rod which prevents scuffing resistance and promotes corrosion protection. 9-position tuning technology that delivers 9 incremental steps of differing flexibility, starting with OE style and reaching firm towing levels. 1-1/4”. Diameter Sintered Iron piston that provides structural integrity. The Fox rear pair of shocks give you an additional 0” to 1” lift and is easy to install. 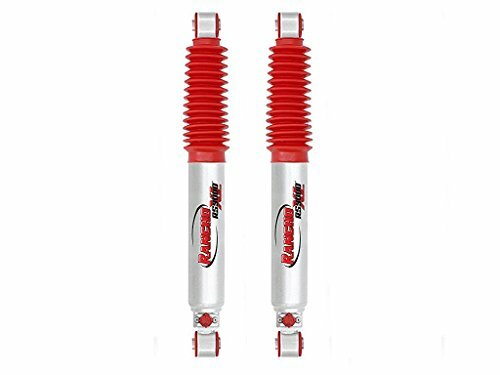 These are monotube gas filled 2” aluminum alloy shocks that are designed to provide a corrosion free performance with their extra light seamless aluminum body. The body is a 2.0″ metal-impacted 6061-T6 aluminum. The body plating is a clear anodized finish that prevents oxidization. The internal IFP reservoir design assures total separation of the nitrogen gas from the oil. The internal components are made of black-anodized, CNC-machined 6061-T6 billet aluminum. The bushings are made of nitrile rubber. The piston is a high-flow race design machined for faster reaction and better rough surface performance. This kit also comes with a rooster shield kit that attaches securely to the shock, providing extra protection. When it comes to OEM performance shocks then the King Shocks® #25001-154 are the ones you want to install on your truck. 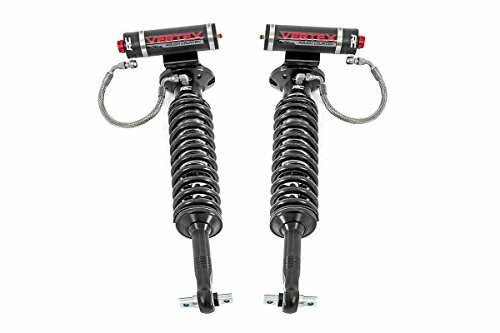 These are non-adjustable shocks engineered to provide the best performance levels without changing the dynamics of your vehicles original application. The body is made of 2.5″ Shock cylinders which are precision bored to within +/- .001, to improve their performance they are plated with cadmium for an optimized valving function. The piggyback reservoir is made from that is both lightweight and strong, giving the nitrogen gas charge a better heat dissipation property. The wide diameter shafts provide you with a 100,000lbs/sq. Inch minimum tensile strength. Added to that is a chromed micro-polished finish for extended seal life. The rod end is lined with Teflon coated steel bearings. The pistons compressed length is 63” and extended length is 24.56” with an overall stroke length of 8.93”. These shocks come with Aeroquip high-pressure hoses and an internally threaded top cap designed to provide maximum piston travel in the shock body. 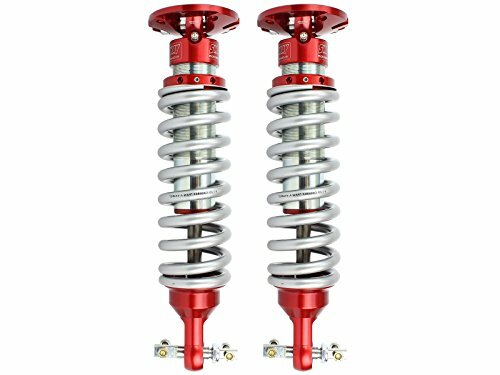 These coil-over shocks come with a truncated thread that delivers incredible strength while providing easy spring preload and height adjustment properties. The pinch bolt coil adjuster nut gives you an improved clamping force. The Rulon composite wear bands composite delivers optimized wear resistance. Dirt Logic 2.5 Front Lift Coilover with 4″ Front Lift Height (FTS21181) by Fabtech® is a complete hybrid shock and suspension system. These strong beasts of burden provide you with a comprehensive solution to all your off-road and on-road requirements. Now let’s take a closer look at these amazing shocks. They are monotube gas charged design for a 4” lift kit application. The body is made of stainless steel for extra strength, performance and corrosion resistance and the piston is made from a precision machined aluminum alloy billet. Rough Country’s Nitrogen-charged Vertex Front Shocks is a monotube shock design with an external reservoir. This design is proven to provide extra oil capacity and improves damping sensitivity. This is a monotube with nitrogen gas filled shock, and an oil reservoir connected with a steel braided line. These shocks come with 2.5” diameter piston with a 22mm piston rod made from chrome alloy steel. The 2.5” design provides 56% better fluid capacity than a standard 2” design. The extended rod length is 95” and the collapsed length is 20.59” which provides a 4” extension. An 8-Stage adjustable damping feature for different applications. The 3-Stage seal system is designed to prevent any oil-air-gas mixing or loss of pressure. The bearing is made of a heat-treated steel alloy for a smoother operation. The steel body combined with the aluminum alloy accents are finished off with zinc plated for extra corrosion resistance. 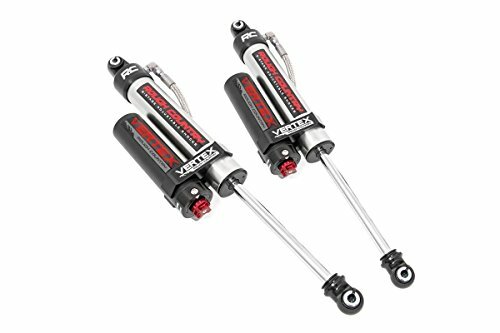 Rough Country’s Nitrogen-charged Vertex Rear Shocks is a monotube shock design with an external reservoir. This design is proven to provide extra oil capacity and improves damping sensitivity. This is a monotube with nitrogen gas filled shock, and an oil reservoir connected with a steel braided line. The extended rod length is 07” and the collapsed length is 19.92” which provides a 13.15” extension. Designed for models with a 5” to 7.5” lift. These shocks all passed a >400-hour salt water spray test. The aFe Power 501-5600-01 Control Sway-A-Way kit brings you a 7/8″ Polished Nitro Steel shaft that provides extra strength and durability combined with their Teflon lined steel spherical bearings for durability and smoother operation. The shock oil is also adjusted for optimized performance and is a synthetic 7wt. These shocks come with a direct fit design which means you can install them immediately without making any modifications. 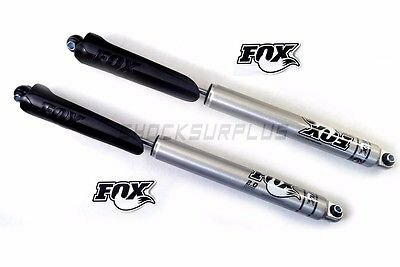 Where do I start with these FOX 2.5 Factory Series Coil-Over IFP Reservoir Shocks? They are the product of experience and design and combine all the elements of strength, durability with style and finish. 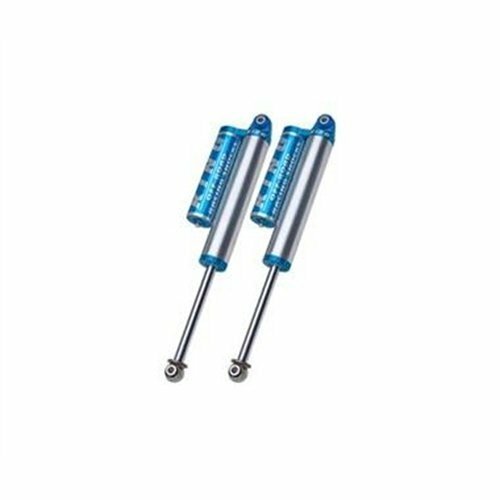 These shocks come with 7/8″ 17-4 H900 hard-chromed stainless-steel shaft which is perhaps the most rugged of all the shocks on the aftermarket for this application. These are 2.5” seamless aluminum alloy shock bodies plated with zinc for extra protection. They use an external reservoir design to separate the oil from the nitrogen; this also provides a larger capacity bearing specification that delivers an optimized cooling feature. The large-diameter spherical bearing was added to optimize steering quality and control. Obviously, they come with IFP (Internal Floating Piston) that delivers more efficient damping by isolating the shock oil from the nitrogen. As promised, here is a quick review of the different categories. Conventional telescopic shock absorbers; these are gas and oil filled pistons that have an extension capacity defined by the application. They are not for the suspension, only work as shock absorbers. 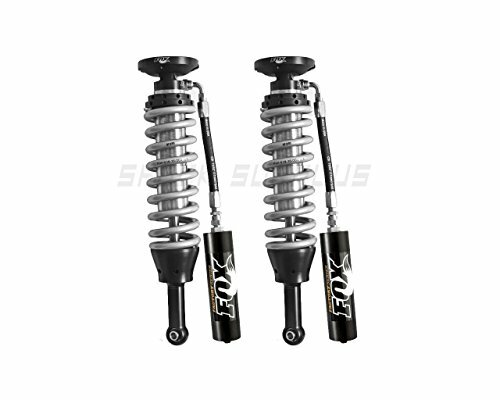 Strut type shock absorbers: these are suspension-based piston shock absorbers that provide shock absorption properties with some suspension relief. 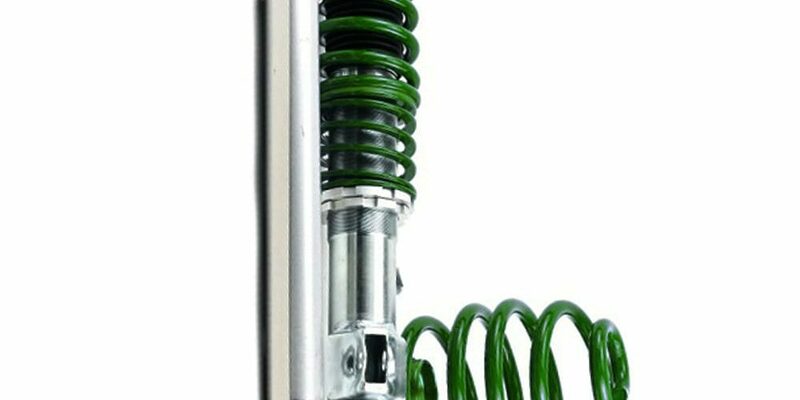 Spring seat shocks: these are the most expensive models, they are a combination of a strut-type with a heavy-duty spring and are meant to be a complete suspension and shock absorption system.